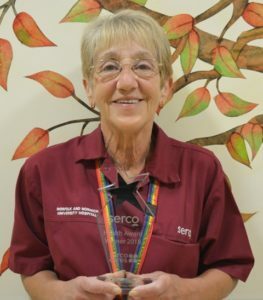 Jacqui Woodham with her national Serco award. 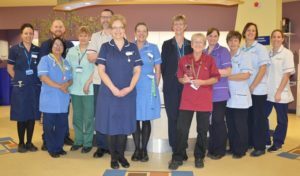 A domestic at the NNUH has received national recognition for her excellent work. Jacqui Woodham, a domestic on Cringleford ward, was presented with the national Serco Health Award 2018 at the annual awards ceremony in Glasgow. She was nominated by ward staff because she consistently scores highly in their cleaning audits, and on one occasion helped draw their attention to a patient who needed critical help. Jacqui, who has worked at the NNUH for 12 years, travelled to the glittering ceremony with several colleagues. Although feeling embarrassed to collect the award, she admitted the experience was ‘fantastic’. Claire Brown, sister on Cringleford Ward, said: “It’s lovely, I’m so proud of her. She’s very much part of our team. We asked for her to move with us when we relocated from Denton ward because of her consistent, excellent standard of cleaning. The nomination recognised that she went above the call of duty. Award winner Jacqui Woodham with staff from Cringleford ward.